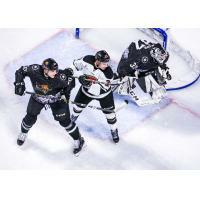 West Valley City, Utah - The Utah Grizzlies are back at Maverik Center for a 3 game series with the mountain division rival Rapid City Rush for games on March 14, 16 and 18. March 14th is the only Thursday home game all season. There will be a Food Drive presented by Ford. Fans are encouraged to bring any non-perishable food items to donate. It will be the first home game for the Grizzlies since the thrilling 4-3 overtime win over the Maine Mariners on March 2nd. Military night Presented by Mark Miller Subaru is a big one for the Grizzlies on Saturday, March 16th. The Grizzlies will be wearing specialty jersey's that will be auctioned off after the game. There is also a Beer Fest ticket special. For more information on that, call the Grizzlies at (801) 988-8000. March 18th is the final Maverik Monday as the homestand concludes with Rapid City. With Maverik Monday tickets are buy one get one free when you show your Maverik Adventure Card at the Maverik Center Box Office. It's been a rough stretch for the Grizzlies, who have lost 10 of their last 11 games but they are still just 3 points behind Idaho for first place in the division and 2 points behind Tulsa for 2nd place. Utah was shut out by Rapid City goaltender Adam Carlson last Wednesday and Friday. Carlson stopped each of the first 70 Utah shots until Cole Ully scored with less than 4 minutes left in the first period on Saturday. Ully has 14 goals on the season and has scored a goal in 4 of his last 6 games. Jake Marchment added his 15th goal of the season in the third period on Saturday night, when the Grizzlies got a standings point in a 3-2 shootout loss. There's only 5 more home games left in the regular season. Tickets are available now at utahgrizzlies.com, the Maverik Center Box Office or any Smith's Tix location. Goals per game: 3.27 (11th in league). Penalty Kill: 86.2 % (Tied 3rd). Cole Ully scored the first goal of the week after Rush goalie Adam Carlson stopped the first 70 shots vs Utah. Caleb Herbert is 4th in the league with 29 goals and is also 2nd in the league with 63 points. Herbert is 4th in the league with 23 power play points. Teigan Zahn leads all defenseman with 185 PIM. Forward Josh Dickinson was assigned to the AHL's Colorado Eagles. Dickinson had the game winning goal on March 2nd vs Maine in overtime. March 6th Rapid City 1 Utah 0 - Adam Carlson 24 save shutout for R.C. March 8th Rapid City 3 Utah 0 - Adam Carlson 41 save shutout for R.C. March 9th Rapid City 3 Utah 2 Shootout - Cole Ully (14) and Jake Marchment (15) scored goals for Utah. Caleb Herbert had 2 assists. Kevin Carr stopped 27 of 29 shots. Grizzlies had a streak of 38 straight successful penalty kills come to an end on March 9th at Rapid City. Both Rush goals in regulation came on the power play on March 9th. Utah has lost 10 of their last 11 games. Grizzlies had 99 shots on goal in 3 games at Rapid City last week. For the first time all season the Grizzlies rank outside the top ten in goals per game (11th at 3.27). Despite the rough stretch, the Grizzlies are still just 3 points behind Idaho for first place in the division and 2 points behind Tulsa for 2nd. Thursday, March 14th Rapid City at Utah 7:00 pm - Classic Country 1370 AM, 104.3 FM/HD-2. Saturday, March 16th Rapid City at Utah 7:00 pm - Classic Country 1370 AM, 104.3 FM/HD-2. Thursday, March 14, 2019 - Rapid City at Utah 7:00 pm - Food Drive Presented by Ford. Saturday, March 16, 2019 - Rapid City at Utah 7:00 pm - Military Night Presented by Mark Miller Subaru (Specialty Jerseys), Beer Fest. Monday, March 18, 2019 - Rapid City at Utah 7:00 pm - Maverik Monday, Buy One Get One Free Tickets With Maverik Adventure Card.